The U.S. Government has made it mandatory that all motorcycle riders have current motorcycle insurance coverage. A very good reason to have insurance is for example, If you have an accident, your insurance will prevent you from paying large amounts of cash out of pocket. In order to be covered properly, it will depend on what is actually included in your policy. Liability Coverage is required. If you are involved in a collision with another vehicle, then your insurance will pay the damages you have caused to the other individual. 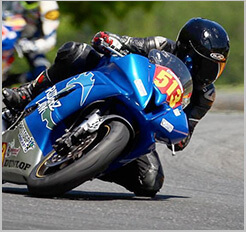 One area that is not covered by liability insurance is your motorcycle itself. You will have to pay for any repairs to your bike. Collision Insurance will pay for damages to your motorcycle if you are involved in an accident and it dosen't matter who is at fault. This is one of the most popular types of coverage. Collision insurance is very good protection but it does not insure you if your bike is stolen or vandalized. Comprehensive Insurance will provide protection in the event your motorcycle is stolen. According to government statistics, there are a large number of motorists that do not have any vehicle insurance coverage. Should you ever have an accident with an uninsured vehicle don't panic, because if you have uninsured motorist coverage it will assist you to pay medical expenses and also any wages you have lost from your job. Uninsured motorist coverage will not pay for any bike damages you may incur. Uninsured motorist property damage coverage will protect you and your motorcycle, but it dosen't cover your passengers. You should make a good decision regarding your insurance coverage, choose a policy that will provide help when you need it and prevent worries you may have concerning your motorcycle. Road safety against any hazards is very important. There are different types of insurance and choosing a policy carefully will definitely insure that you are protected according to your specific needs. The best policy is a safe policy that will protect you against a variety of unexpected damages to your property and yourself.